This time of year, I just keep weaving, and weaving, and weaving to build up my inventory for the coming show season. It’s nice to weave light, lacy fabrics when it’s cold out – it makes spring seem right around the corner. Of course this year, we had a week of summer before winter was even over. Despite my weather concerns, I’m still enjoying weaving scarves for spring and summer. I’m using up that hand painted yarn I ordered. And yeah, I’ve subsequently ordered two more batches of Tammy’s yummy yarn. It’s no surprise that I like saturated colors, and gemtones, so it’s completely fitting that one of my personal favorites is Tammy’s Ocean Waves colorway. I’ve used it in rayon chenille, bamboo, bamboo-cotton, and tencel. It’s always successful, and always popular. So I ordered a bunch more. This time in a blend of bamboo & tencel. I worked out a new lace design for my little 4-harness counterbalance loom, and warped for four scarves. I could vary the treadling and create two somewhat different lace designs – either an open cross of four lace squares or a mini checkerboard of five. 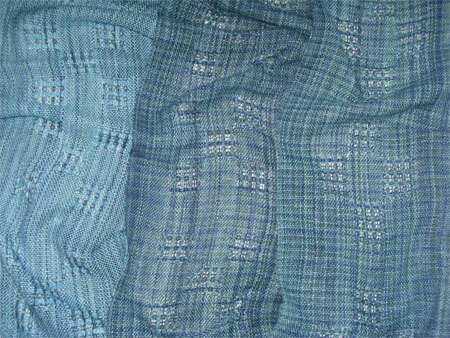 The two scarves on the right look the same color in real life – no idea why they look so different in this picture. For the first three scarves, I used the same variegated yarn for both warp and weft. For the fourth, on the left in the photo, I used a solid, bright turquoise bamboo. It really lightens those scarves up a lot. I wasn’t positive if I’d like it, but I do. I like them all. After I twisted the fringes and wet finished these scarves, I wasn’t ready to be done with the watery-colored yarn. So I measured out another warp of three scarves, this time in a log cabin pattern with black bamboo. Although weaving with two shuttles takes me more than twice the time of weaving with one, the end result in a log cabin weave makes the time investment worthwhile. 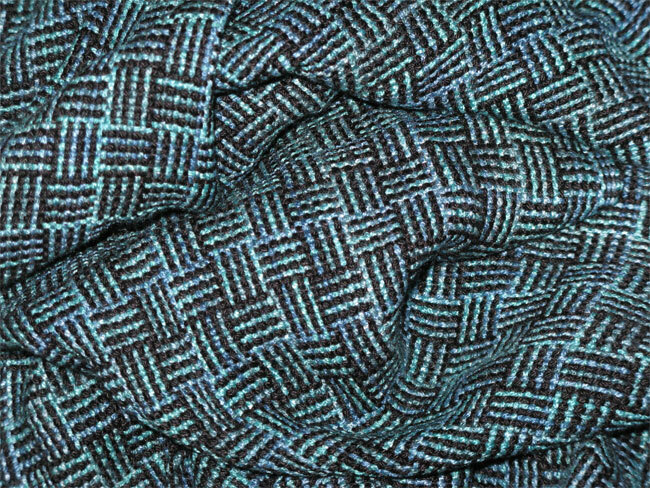 It turns a plain weave into something that thrills the eye. At least it does for me. I will definitely have to weave some more log cabin for this season. I have so many more things I want to weave, so many ideas. There’s no way I can build in time to weave everything I want to. At least not if I want to sleep. And I do love to sleep. Still, despite my long stretch of unproductive time due to the nasty virus, I’ve completed 67 handwoven scarves, plus the 10 towels and 3 baby blankets since the first of the year. 30 scarves in March alone. I’m threading a loom for a warp of 2 shawls right now, and I’m hoping I can add them to my list of March completions. Your turn: what’s one of your personal characteristics, or behaviors, if you prefer?